Imagine wishing someone on a special day with Flowers with Guitar. Sounds filmy, exciting and impossible right? Not anymore! With bookaflower.com send flowers with guitar and make their day more special! Although it sounds a completely romantic idea, flowers with guitar is an equally good idea to express love towards your family and friends. The excitement that lies in this idea would be clearly visible in their eyes! With bookaflower.com order and send flowers with guitar and get it delivered on the same day to any place in India. 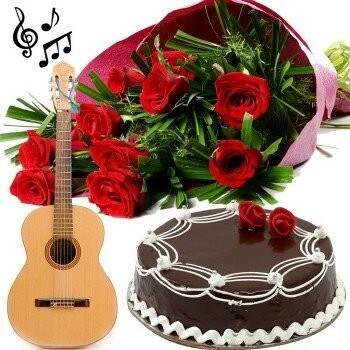 We also offer midnight delivery of cakes and flowers with guitar which would make the feel better and better! Remember our prices are less but not the quality of our services!